For the cream puffs: Place the water, butter, granulated sugar, lemon rind, and salt in a large saucepan. Bring the mixture to a boil, and as soon as the butter has melted, remove the pan from heat. Add the flour all at once, stirring constantly and vigorously. Return the pan to the heat, and stir constantly until the mixture forms a ball and comes away from the sides of the pan. Continue to cook a little longer, until you hear a slight crackling or frying sound. Remove the pan from the heat and cool slightly. Add the eggs, one at a time. Be sure that each egg is thoroughly blended into the mixture before you add the next. Keep stirring until the dough is smooth and thoroughly blended. Add vanilla. Cover the dough and let stand 15-20 minutes. Drop dough by heaping Tablespoonfuls on a buttered cookie sheet, leaving 2 inches between the Sfinge. Bake for 20 to 25 minutes, until they are golden brown. Remove them from the oven to cool. For the filling: Mix the ricotta, confectioner’s sugar, vanilla, cinnamon, chocolate and pistachios (and peel, if using). 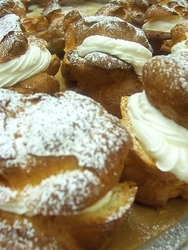 For best results, fill cream puffs just before serving: Cut each cream puff horizontally partway through the middle and fill with the mixture. Sprinkle with confectioner’s sugar.